I am always a fan of medical thriller or legal thriller fiction! I have enjoyed reading other books by Richard Mabry, and I enjoyed this one too!! As it goes with medical mystery/thriller novels there is usually a death, in this case a few. Throw in a doctor (or two) and mix it all up and you have the beginning of a book that will grab you and take you on an exciting journey. I definitely felt this was a quick moving book, with several different story-lines going on. Shannon is the main character who is having to deal with the mysterious death after a man dies in her front yard. To make matters worse she begins to receive threatening phone calls which have her a bit worried. At the same time her sister is staying with her as she is trying to get her life back on track. I enjoyed the depth of Shannon’s character, but also the issues she is facing and dealing with. Her faith is not what it once was, and through this story is grappling with who she is and who she is in relation to God. While dealing with all these things, at her side is her boyfriend Mark. As a strong believer, Mark often encourages Shannon to rely on God and trust him, and he is a source of tremendous strength and encouragement. Their relationship is very sincere and real, and I enjoyed watching them both grow individually and together throughout the story. I enjoyed this book, it would make a great read for a summer vacation! 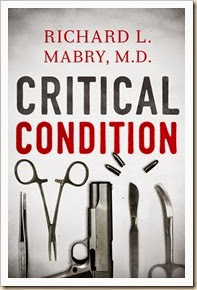 NOTE: I received a copy of Critical Condition from LitFuse in exchange for an honest review.